Michaela Atanassova in Gaming Uncategorized on 9 March, 2017. For most gamers excited for the final season of Game of Thrones the following upcoming medieval games should be a perfect occupation to feed the impatience and spice up the wait. Others who feel stressed about exams can find an engaging historical setting in each of the games and give themselves a short break from commitments. Recently the worldwide critical success of Dark Souls and franchises like the Elder Scrolls have set the foundations of gameplay and character development for subsequent releases in the genre. The basic principles are kept unchanged but combining the setting with either RPG open-world characteristics or MMO massive online campaigns surely give some fresh air from all the recent shiny sci-fi adventure trend or repetitive task-completionist style. What most of them promise to live up to is immersive gameplay from first-person perspective and focus on gameplay which offers a unique development path for the character. Although almost all of the games are inspired by European medieval history and incorporate the traditional etiquette in the story, War Rage’s choice is the romantic ancient Chinese background supported by the biggest war in Chinese history between its Three Kingdoms in the 8th century AD. It is and MMO/ RPG where you can choose from typical battle units like heavy cavalry, archers, spearmen, swordsmen and lead your army to conquer or defend a city. You can control a general or fire a canon to bring city’s walls down or just defend it. While you play with your character you are supposed to strategically move your troops and it gives a dynamic fast-paced setting of the battlefield. On the other hand, Black Death your character has to survive in a cruel environment where equipment doesn’t last long. It is multiplayer where you choose whether to develop as a blacksmith, defending the weak as a knight or living as a merchant. The wealthier and stronger you become, better chance to survive (and careful with those wounds). Of Kings and Men (MMO/RPG) places your character in a giant persistent world where your goal is to collect resources in order to build settlements and conquer territory. From one-on-one duels to massive 200+ player wars – has numerous PvP options & modes like Team Deathmatch, Conquest, Instant Battle where you can join a faction and defend territories, pool resources or fight for a common cause. 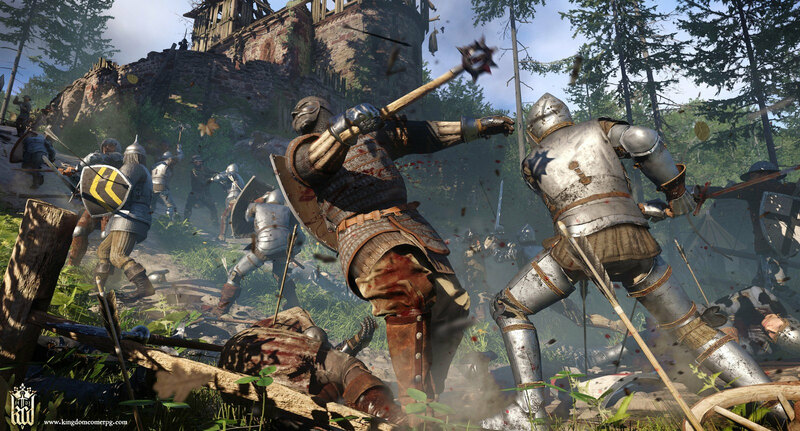 Similarly, Kingdom Come Deliverance – single-player open-world with classless roleplaying game system where you can become warrior, bard, thief or a combination of the three. In the Bohemian era your abilities will depend on chosen options in the dialogue trees where time to decide is limited. Throughout your reputation is built and it bring consequences to your relationships. It contributes with its smooth gameplay and immersive setting. In addition, Gloria Victus’ low fantasy open world focuses on realism of the atmosphere and it contributes with its deep crafting system. Your player can be chosen from 5 nations that are at war and influence the outcome which sounds like the epic hero of Skyrim. The next set of games will greatly drive the gameplay of the genre by further developing the fluidity of FPS one-on-one dynamics in a duel. Mordhau ( in German swordsmanship schools means murder-blow) make dueling quite challenging because your anticipation of the opponents’ actions has to correspond correctly with the timing of your reaction. In this sense it makes a great simulator of medieval swordsmanship because it promises to further develop melee combat. Chivalry: Medieval Warfare which is comparable to Fallout and the Elder scrolls because of the reminiscent arena fighting may have given the motivation for Mordhau developers to improve the style of gameplay. For all the avid multiplayer gamer Ubisoft is releasing in 2017 their version of a medieval game: For Honor, which is basically dueling other players in a third- person view. The characters – Warborn, The Chosen, The Legion- correspond to viking, knight, samurai. Each one has four classes – Vanguard (well- balanced offence and defence), The Assassin (fast, very efficient in a duel but less damage), Heavies (resistant to damage, slow attacks), Hybrids (combination of three classes give uncommon skills) which you need yo figure out how to effectively develop. The entertaining thing to see is whether the debate about who is the greatest warrior of the three elite will be resolved realistically. Personally, of all the projects that will come out this year Mount and Blade:Bannelord is the one I feel most excited about not only because of the long wait but also because TaleWorlds have taken seriously into consideration fans’ feedbacks. The story starts with the decline of the Calradian Empire which is analogous to the fall of the Roman Empire and the establishment of the Middle Eastern, North African and European kingdoms. Armour and weapons are inspired by the period of 600-100AD and are in a planet of a variety. The main reason for the dedication of the followers of the genre to this particular games is its hybrid gameplay between real-time strategy and open-world RPG where your character can choose to serve a king or to build a kingdom and conquer territory. As many strategy games it involves diplomacy where you either negotiate or take up quests that will improve your level, relationship and give you experience. You are king with vassals and generals but you are also an epic hero who can make a difference for peasants. It is one of the most anticipated because it will have vast improvements on graphics (new engine) and more open gameplay where you choose companions, enemies and nature of leadership. To sum up, in 2017 we will see great improvement in the medieval genre as it incorporates more elements from other genres and the focus is rigorously shifted on gameplay and character development. Significantly has changed the setting which will be more open like and RPG and the battles which will be more dynamic than the real-time strategy games because you will personally command and lead your troops into battle. There is something for every style of playing whether you are a more single-player type or a more social team-player where you can compete with other factions/guilds and increase influence. No need to mention the vast variety of weapons, armor, ability development paths, magical objects and army upgrades. It will be delightful to see if the game developers deliver each in its own way a unique contribution to the genre that will make game experience more immersive and satisfying no matter whether it is medieval setting, fantasy or sci-fi.